Welcome to Nadia Mercuri’s website. Nadia Mercuri is a Contemporary Glass Artist based in Melbourne. She has completed a Master of Fine Arts degree, majoring in glass forming. 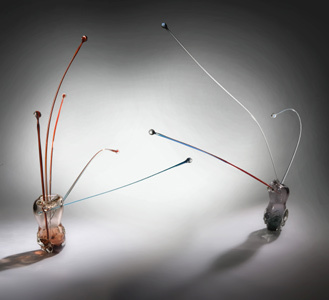 Mercuri has been exhibiting widely across Australia since 2001 in many group shows including Wunderkammer: The Museum of Lost and Forgotten Objects at Counihan Gallery, 3 Vitreous Bodies at Wagga Wagga Museum of Glass, and SCAP-3. She has also held two successful solo exhibitions. In 2015, 2008 and 2007 her work was selected for the Tom Malone Prize. In 2012 she exhibited in “Alphabet” held at Craft A.C.T. The exhibition has been acquired by Canberra Museum and gallery. Nadia’s work is collected both nationally and internationally.